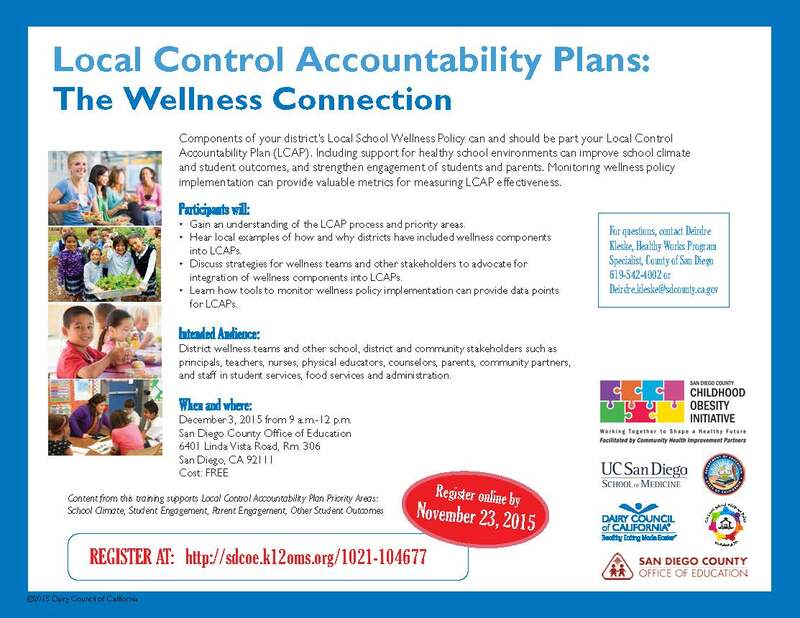 Save the date for a FREE workshop on “School Local Control Accountability Plans: the Wellness Connection,” December 3 from 9 a.m. – 12 noon at the San Diego County Office of Education (see flyer). Please help us get the word out about this exciting opportunity to gain an understanding of strategies for school wellness teams and other stakeholders to advocate for integrating wellness components into the school district budgeting process. You will hear from the California Department of Education and local district staff about of how and why districts have included wellness in their LCAPs. You will also learn about tools to monitor wellness policy implementation – a new requirement under the Healthy, Hunger-Free Kids Act. District Wellness leads and committee members are strongly encouraged to attend!